If you ever heard that, of all the rooms, properly staging the kitchen is critical, you heard correctly. It might sound a bit old fashioned to say it, but the woman normally still has final say on which house gets bought and, without a great looking kitchen, she’s going to keep right on going down the block to the next one. The good news is that staging the kitchen doesn’t require an advanced degree in interior design. 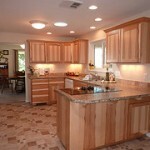 There are a few very simple ideas that go a long ways toward making your kitchen the star celebrity it should be. Unlike most other rooms in the house, furniture and appliances are built in, so there’s no re-arranging or trying to figure out the best point of view.